… it’ll be the next Cinque Terre. It is surprising to me, given his Norwegian heritage, that Rick Steves gives short shrift to this country. His Scandinavia guidebook includes Oslo, Bergen, and the fjord region, and that’s it. Fredrikstad is exactly the kind of place he likes to discover and reveal to Americans. It has history and also is a place where Norwegians just have fun. 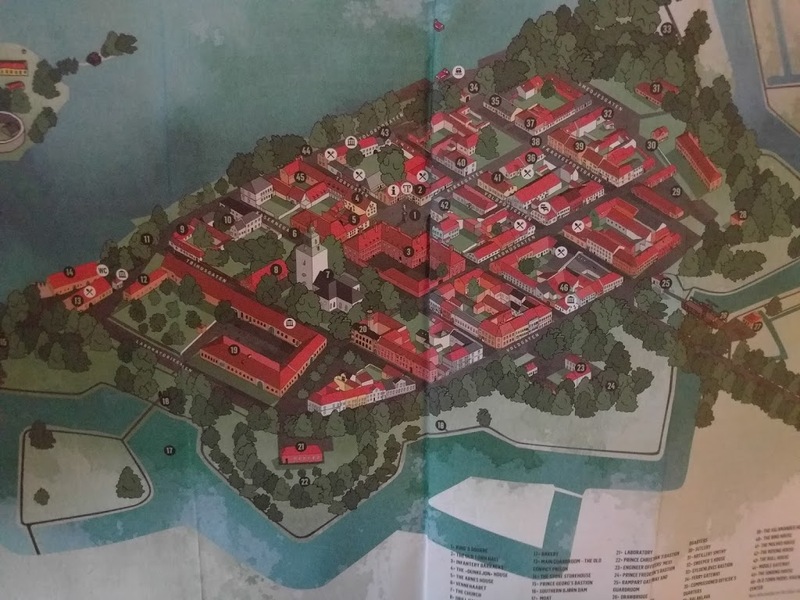 This is the map I got from the tourist information office at Fredrikstad. It is an old fort with a moat. In addition, the area around Fredrikstad includes a busy riverfront and a whole slew of islands for swimming, sunbathing, hiking, or relaxing. It is just over an hour by train south of Oslo, and is supposedly very popular with Norwegians. Summer weekends here are hopping. But I was here on a drizzly, dreary Monday, and there was almost no one around. In spite of the weather, I did enjoy seeing Fredrikstad. The fort is across the river from the main part of town, and a cute free ferry takes passengers back and forth in about 45 seconds. The ferry operator waited for me and another guy coming from the train, and then, after pulling away from the dock, backed up to pick up an approaching bicyclist. The people I talked to in Fredrikstad were tremendously friendly. The woman at the TI seemed overjoyed when I came in. I was probably one of her few customers all day. When I went to a cafe for lunch, a man visiting from Manchester got into a conversation with me about how he frequently comes here and loves coming to this cafe. And the woman working there was delighted to find out where I was from and where my travels were taking me. I wish I could have been there on a sunny summer day, though I suppose the crowds could be overwhelming. Who knows what would happen to the poor town if the Americans learn about it and start showing up in droves? Prior to my trip to Fredrikstad, I went to see the Rådhus, or city hall, in Oslo, which had been closed all weekend. I’m glad I got to see it. It’s a beautiful building, and the interior rooms are filled with stunning murals depicting various aspects of life in the city. In Amsterdam (both on the Euro) a pay toilet cost 50c (about $0.57). Here, it’s 20 Nkr ($2.50). An ice cream cone in Amsterdam was maybe 2 Euros for a scoop ($2.25). Here, 40 Nkr ($5). I had a bowl of soup for lunch today in Fredrikstad. It came with a piece of bread and some butter. It cost 100 Nkr ($12). A beer at a restaurant or cafe in Belgium was between 2 and 3 Euros. Here it’s upwards of 90 Nkr ($10). As my Airbnb host said, he has discovered the perfect way to not worry about how much beer costs at a restaurant: have 3 or 4. I’ve found an alternative approach: no beer. I’m leaving for fjord country early tomorrow morning (my train departs at 6:25). I’m told the trip is one of the most scenic train rides in the world, and the weather forecast is for sunny skies. I’m psyched! I’ll see you tomorrow in Balestrand. Have fun in the fjords, you’re seeing so much! The concert sounds great!